Victoria Feldman offers an array of transformative workshops to corporations, family-owned businesses, small businesses, organizations and entrepreneurs seeking to form better and higher communication that is in alignment with their cultures and missions. One of the most rapidly developing fields in modern science is how our brains work. How we think, feel, believe and react sets us up for failure or success. Pondering how the brain processes information and what role consciousness plays, scientists and practitioners alike are addressing the nature of the mind-body-spirit connection. 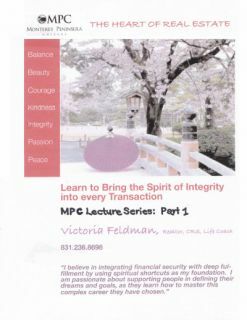 Victoria developed a series of workshops which are rooted in Universal Laws. 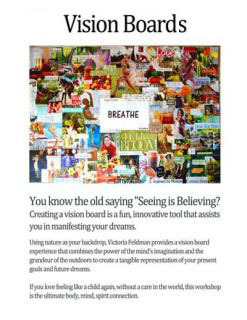 From Vision Boards to Positive Psychology to Optimism, Mindfulness and Clarity, she uses proven tools and techniques that assist the participant in raising their vibrations to match their desires. 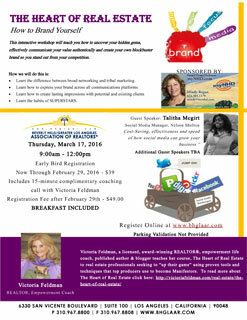 These workshops can be tailored for any organization, business or corporate entity. They are just as effective in small groups as they are in large settings. Prices subject to change depending on venue. CLARITY-you will learn how to make a lasting first impression & establish trust with potential clients by being clear, concise and credible. CREATIVITY-you will be invited to participate in creative exercises that will empower you in perfecting your manifesting skills. COMMITMENT-you will learn how to be a “Realist” instead of an “Idealist” by committing yourself to positive, happy thoughts. Master your own unique style as an entrepreneur & create a network of grateful clients who will refer you over and over again. Improvisational exercises that will amplify your vision and boost your sales. Access your authentic, fearless self. Manifest goals you think are impossible to accomplishments that flow naturally using your internal powers. 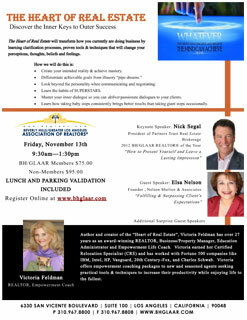 Victoria Feldman is a Life & Productivity Coach, Published Author and Award-Winning Realtor. Victoria has published two books,“This is Not Goodbye…It’s Halo” which won the Benjamin Franklin award and was endorsed by Dr. Elisabeth Kubler-Ross. a Swiss-American psychiatrist, who wrote the groundbreaking book “On Death and Dying”. Her second book, “Hello, Beautiful-How the Power of Self Love Heals & Transforms You Forever” is written in a workbook style format that offers the reader real tools, practical steps, and empowers them to make better choices. 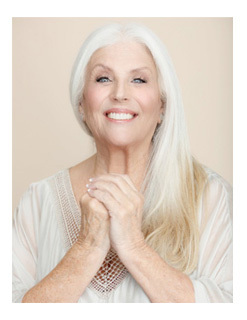 Victoria founded “Creative Expressions”, Malibu’s first higher consciousness program for grades K-6. Using the Children’s Material from A Course in Miracles as the foundation for the program and Esalen Institute’s Gazebo school as her inspiration, her program had a three year wait list. As a single parent and sole provider of two young children, Victoria segued into Business Management, In 1988, upon the advice of her client, Joyce Rey, legendary Realtor, Victoria obtained her real estate license. Victoria loved helping corporate executives relocate and earned her CRS (Certified Relocation Specialist). Her clients came from Fortune 500 companies like IBM, HP, Intel, Robinsons-May, 20th Century Fox, Vanguard and Charles Schwab. In 1998, Victoria relocated to the Monterey Peninsula and joined Alain Pinel Realtors. Selling $100’s of millions in real estate in a few short years, she was awarded membership in Alain Pinel’s elite President’s Roundtable,Top Sales Agent and Top Listing Agent. Victoria, heeding the call to become a Life Coach, attended CTI (Coaches Training Institute), known as one of the world’s most rigorous coaching institutes. 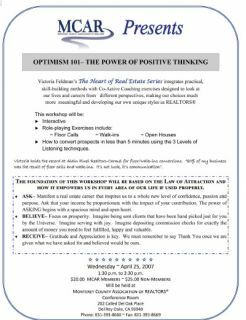 She is a member of ICF (International Coaches Federation) and her course The Heart of Real Estate has been taught at Boards of Realtors, individual real estate companies, to individuals and groups. 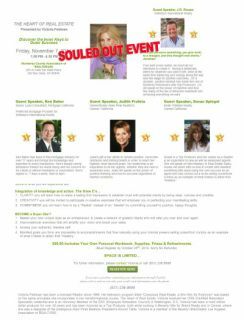 Victoria also offers life coaching packages to corporations, organizations, family-owned businesses and entrepreneurs. As an empowerment coach, Victoria believes in the integration of life coaching with productivity coaching to help people align their careers, relationships and creative endeavors with their spiritual values. Her intuitive approach to making life changes is based on learning to love yourself completely so that you can truly love others with a healed heart.